Francois Hollande and Vladimir Putin shake hands during a meeting in Moscow's Kremlin. Russia considers it necessary to create a broad international coalition against terrorism, Russian President Vladimir Putin has said. "We can see that you are paying much attention and making a great deal of effort towards creating a broad anti-terrorist coalition," he said at a meeting with his French counterpart Francois Hollande in Moscow on Nov. 26. "You know our position, we are ready for such joint work. Moreover, we consider it absolutely necessary and in that sense our positions coincide," the Russian president said. "We are ready for this cooperation, Mr. President," he said. Putin recalled that "Russia suffered serious losses as a result of a disgusting terrorist attack against the civilian aircraft." "All this makes us unite our efforts in the fight against this common evil," the Russian president said. In his turn, Francois Hollande said that he came to Moscow to coordinate actions in the fight against terrorism. "Now the time has come to assume responsibility for what is happening," Hollande said. "I came to Moscow so that we together would be able to coordinate our actions against the common enemy," he said. 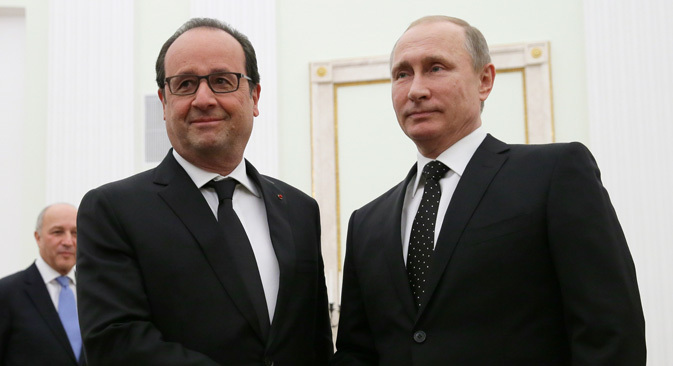 Russian President offered condolences to Francois Hollande over the terrorist attacks in Paris. "We are mourning together with you the losses France suffered. According to the latest reports, as far as I am concerned, 130 people are dead and more than 350 are wounded," Putin said. "We understand your feelings and the feelings of the French people. I know that a remembrance day for the victims of terrorist acts will be marked tomorrow," the president said.